Spondylolisthesis is a Latin term meaning slipped vertebral body (spinal bone). 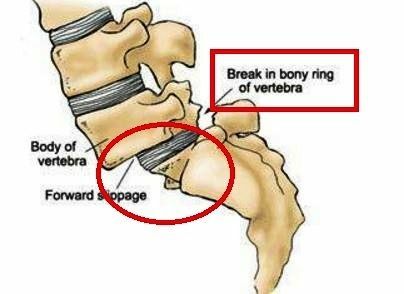 “Spondylo”= vertebrae “listhesis”=slippage. Spondylolisthesis in the lumbar spine is most commonly caused by degenerative spinal disease (degenerative spondylolisthesis), or a defect in one region of a vertebra (isthmic spondylolisthesis). The term anterolisthesis refers to anterior displacement (forward slip) of vertebral body relative to one below.